The battle between the Ferrari and Maserati factory teams moved to Berne in late August. Juan-Manuel Fangio took pole but the Ferraris of Alberto Ascari and Giuseppe Farina were alongside him on the front row. Maurice Trintignant did extremely well in his Gordini to beat Onofre Marimon's Maserati and the Ferraris of Gigi Villoresi and Mike Hawthorn. Maserati's Froilan Gonzalez was still out of action but the team ran Emmanuel de Graffenried instead and even entered a fifth car for prewar star Hermann Lang. At the start Farina was left behind and it was Ascari who emerged ahead after an initial surging start from Fangio. 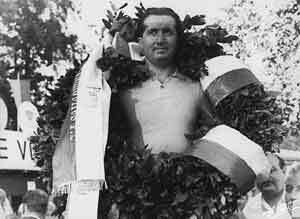 A fast-starting Hawthorn was third with Marimon, Villoresi, Felice Bonetto (Maserati) and Farina chasing. Farina gradually worked his way through the field to third and then on lap eight Fangio began to have gearbox trouble and slowed. He eventually pitted to take over Bonetto's car. Fangio charged hard to make up the ground he had lost. Unfortunately his engine failed on lap 29. Ascari's position looked to be strong but on lap 39 his engine began to misfire and he was forced to stop at the pits. The problem was solved and he rejoined in fourth place behind Farina, Marimon and Hawthorn. On lap 46 Marimon disappeared with engine failure leaving the Ferraris to run 1-2-3. The signaled that the drivers should hold station but Ascari showed no interest in that idea and overtook both Hawthorn and Farina and so guaranteed himself a second World Championship.